Nek Chand's Rock Garden has been selected to feature in India's 65th Republic Day parade in New Delhi on 26th January 2014, The Times of India reports. A motorised tableau representing the Rock Garden will include structures made from recycled materials, a miniature waterfall, murals, and five people acting as visitors. The drive-by will be accompanied by specially composed music. The President of India will be attending The New Delhi parade, and there will be a range of moving tableaux highlighting cultural and social achievements across the nation. A spectacular air force fly-by will conclude the parade. Nek Chand is reported to be proud that his work has been selected for the national celebrations. The Rock Garden is an example of sheer innovation, creativity and a non-communal appeal of which all Indians can be proud. Click here to read The Times of India article, or here for more on Nek Chand and the Rock Garden. Take advantage of our special Christmas offer on RV123! 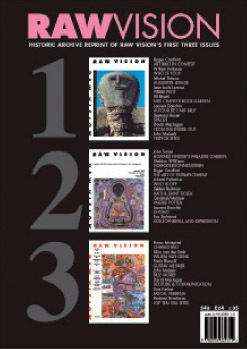 A great gift for art lovers, the historic reprint of Raw Vision's first three issues contains a wealth of archival and reference material. Published 1989-1990, these early issues have been out of print for many years. 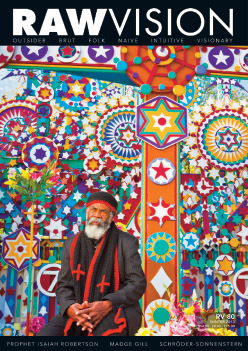 With articles by Roger Cardinal, Michel Thévoz, Laurent Danchin, Seymour Rosen, John Maizels, David Maclagan, Willem Volkersz, John Turner, Bruno Montpied, Sam Farber and Jean-Louis Lanoux, covering subjects such as Nek Chand, Mary T Smith, Pierre Petit, Howard Finster, Haitian Art, Mediumistic Art, Chomo, Van Genk, Pascal Verbena, Augustin Lesage, US Environments, French Environments. Special reduction from $35.00 to $25.00 for a limited time only! Click here to order. For gift subscriptions and a selection of books, visit our webshop.